Dismayed by a dysfunctional process caused by a lack of leadership and the increasing risk of some of the worst case scenarios playing out, we have been staying away from the euro in our hard currency strategy. As of late last week, those dynamics changed: we are giving the euro another chance, not only because of substantial short covering potential, but also because Draghi’s “whatever it takes” approach might bring about seismic changes in how European integration, fiscal and monetary policy move forward. In essence, Draghi told the world that the ECB will act like a central bank of a United States of Europe if the integration of European fiscal policy accelerates. The “integration” process hasn’t worked particularly well. In the early years of the Eurozone, peripheral Eurozone countries used cheap access to financing to live beyond their means. Now, the markets have serious doubts about the sustainability of the finances of weaker Eurozone countries. To regain the markets’ trust, governments have nibbled with austerity measures. While the respective governments will take offense to us using the term ‘nibble’ at their hard fought progress, governments have not been able to reduce their debt loads. Politicians blame the high cost of borrowing and speculators. Unfortunately, as long as debt is merely shuffled around, no matter how big any aid package may be, it is unlikely to bring long lasting relief. In an effort to regain the trust of the markets, governments must engage in credible structural reform. Ireland has successfully gone down this path, but politicians have so far been unable to do the same in Spain, Italy and Greece. In Spain, Prime Minister Rajoy enjoys an absolute parliamentary majority and has no excuse. Italy is run by a technocrat; as such, the market is rightfully suspicious. Greece, well, is in a category of her own. To break the debt spiral of these weaker countries, the European Financial Stability Facility (EFSF) and European Stability Mechanism (ESM) have been put in place. Accessing these facilities comes with a hefty price tag: giving up sovereign control over one’s budget. However, that’s exactly what a United States of Europe needs: tight fiscal integration. While access to the bailout facilities reduces the immediate cost of borrowing, it may also shut the door to selling bonds in the markets at palatable cost. That raises the question of what is a palatable cost of borrowing? In the 1990’s, paying 6% for 10-year debt was just normal for some countries. Yet, because so much more debt has piled up, paying 6% is now considered unsustainable – at least unless such draconian budget cuts are introduced to balance budgets even with such high interest burden. And just in case anyone is wondering, the U.S. would be in just as dire a situation, if not worse, if it had to pay 6% on its long-term debt. We are currently concerned about the “fiscal cliff” in the U.S. – but even if the draconian cuts and increased taxes introduced by the fiscal cliff were implemented, the U.S. budget deficit would still be above 3% of GDP (the level that Eurozone nations are intended to stay below). The difference between the U.S. and peripheral Eurozone countries is foremost that the bond market lets the U.S. get away with its deficit spending. We have long argued that the market provides the best incentive to stop governments from overspending. Spain, Italy, Ireland, Portugal, Greece – all these countries have engaged in astounding reforms, all with the “encouragement” of the bond market. Politicians, however, are most creative in avoiding making tough choices. So how does one square the circle, how does one live with political realities while at the same time provide a path to fiscal sustainability? Politicians have called for the ECB to step in, to buy bonds of weaker Eurozone countries, thus lowering their cost of borrowing. But when the ECB has done that in the past through the Securities Markets Program (SMP), policy makers have lost their motivation to pursue structural reform. Policy makers choose between the cost of acting and the cost of not acting: the moment there is relief in the market, commitment to reform fades. It also puts the ECB into the uncomfortable position of playing judge of whose reform plans are worthy of support and whose are not. The argument for market intervention is that the “monetary transmission mechanism” is broken. That may be correct, but becoming a political hot potato is no attractive alternative for a central bank. So ECB President Draghi announced a new philosophical framework last week: the judge of whether sufficient austerity is implemented to warrant ECB support is the conditionality of EFSF/ESM, i.e. the types of rules the International Monetary Fund (IMF) introduces on countries. It’s the best one can hope for if policy makers don’t accept the market’s judgment. In our view, accepting the market pressure would be preferred, but this is the best course of action given the realities presented. Indeed, we consider Draghi’s action nothing short of pure genius. Draghi’s action is pure genius because it dramatically accelerates fiscal integration in Europe. Already Spain and Italy are contemplating joining the bailout regime, if in turn Draghi will help lower their cost of borrowing. There will certainly be a lot of horse-trading; we also don’t expect all austerity measures to necessarily be fully implemented. But that’s not the point. The point is that weak countries subject themselves to a political body (not a central bank) that negotiates and sets terms. It is the United States of Europe we have been waiting for. With the framework set, the ECB can engage in market operations targeting securities that are part of the program. Draghi already indicated that the focus will be on the short-end of the yield curve (shorter dated Treasury securities); this is akin to what other central banks, like the Federal Reserve (Fed) do; well, the Fed has since moved out the yield curve (longer dated Treasury securities). Longer dated debt will be affected, although significant risk premia over German bonds may continue for some time. Based on other comments we have seen, odds are that not many others, if any, will agree that Draghi’s actions were “pure genius.” After all, he did not provide the immediate relief all those stimulus addicted market participants have gotten used to. But Draghi understands that the best short-term policy may be a good long-term policy. The short-term policies advocated by many pundits, an aggressive purchase program of peripheral bonds would only achieve that holders of such debt can dump their bonds; buyers would be guaranteed to buy such securities at inflated prices, setting them up for almost certain disappointment (and thus scaring them away from future bond auctions). Instead, Draghi achieved a great deal: as fiscal integration in the Eurozone may be dramatically accelerated. Importantly, a political process has been put in place. Ironically, it took a monetary policy maker to put a fiscal process in place; yet, Draghi allowed the ECB to be used merely as a catalyst, not as a political pawn. Draghi also correctly shifts the focus going forward on the increased “fragmentation” in the Eurozone where market participants increasingly focus on domestic rather than intra-European activities. While more needs to be done, other central bank activities under consideration would have amplified rather than reduced fragmentation, would have made the demise of the euro more likely. To address fragmentation issues, work on many fronts needs to take place. Market participants are doing their part by rewriting contracts to clearly state what law they are subject to in case a member country were to leave the Euro. As such, we started buying the Euro again in our hard currency strategy. 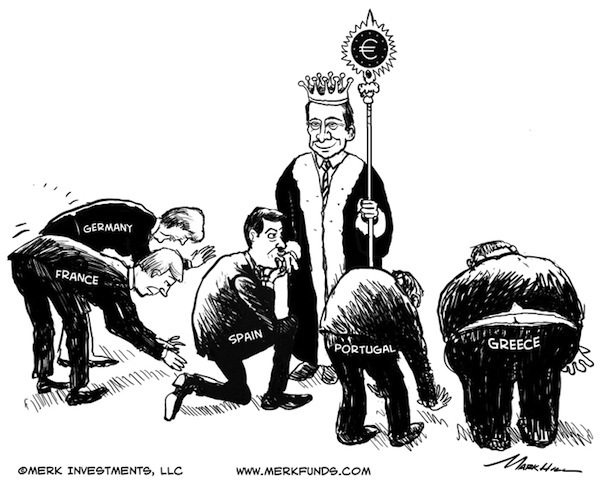 Make no mistake about it: we are only putting our foot in the water; we are not yet wholeheartedly embracing the Euro. But we are giving this new framework a chance, as we judge it to be the greatest progress in the Eurozone debt crisis we have seen to date. The coming months will show whether this is to be written off as a trading opportunity or whether it is the new strategic direction that it has the potential of being. Greece may still drop out of the Euro, but such an exit is much less of a threat to Eurozone and global financial stability than it was as recently as a week ago. Given that currencies trade against one another, this analysis would not be complete without looking at the U.S. dollar. In the U.S., too, many pundits have been disappointed at the lack of action by the Fed. Indeed, we also think the Fed under Bernanke’s leadership is likely to provide more stimulus. But just as Draghi has presented a new philosophical framework for future action, Bernanke may feel he is obliged to provide a new framework for “QE3”. That’s because many have rightfully pointed out that any new action might have limited impact, yet risk ever more unintended consequences. The obvious opportunity that presents itself will be in Jackson Hole, where he will be speaking later this month. The Fed is focused on different issues, notably a sustained recovery after the housing bust. As such, the Fed – and we are putting words into Bernanke’s mouth here – may need to err on the side of inflation. No responsible central banker – never mind closet central banker and chief Keynesian cheerleader Paul Krugman - would ever openly advocate inflation. Let’s just say that Bernanke’s upcoming Jackson Hole speech should be interesting to watch. For now, with the prospect of ECB action – even if with delays and no guarantee - a number of tail risks have been taken out of the Eurozone. In our assessment, that alone warrants a significantly stronger Euro versus the U.S. dollar. As we discussed, we believe there’s a new wind blowing in the Eurozone. That wind may well take the tailwind of recent months out of the U.S. dollar. From T.H: I read your article on the Euro and Draghi. As a European, I think the conclusion is wrong. The problem is that Europeans in general are nationalists and will not let themselves be governed by some central authority, much less by Germany - which less than 70 years ago practically destroyed the Continent. In my opinion, the more likely scenario is that many of the Euro countries elect nationalist governments and that the whole system splits up, probably with several local wars ensuing. Axel Merk: Europe certainly has a communication problem: Germany is trying to help, yet protesters burn German flags in the streets of Athens. Better communication / leadership is necessary; without, I agree, there are risks that go way beyond - not just in Europe. It starts with the squeezing of purchasing power, then a populist rise - we see this to varying degrees in many parts of the world. From E.F: Hi, i read your interesting comments. i think you are overstating what Dragi has done, he has not removed tailrisks. what he has done is a marginal positive to the growth and the sovency of the weak euro countries. its just a better version of ireland's bailout as it may keep the short end of the bond mkt open and will only keep the longend open if spain/italy dont want mkt access over cheaper funds. Its QE nature also helps risk assets (short term). at the end of the day the same question dominates, are spain/italy solvent. only time will tell and he has just shown how to buy more time (if the politicans go along). that was always going to happen in some shape or form. the euro gains as the of capital flow in euro equities/gilts turns positive from doomsday scenario levels reinforced by some short covering. as continued recession and solvency risk continue they will be a temporay positives. Axel Merk: I'm not suggesting all is well because of Draghi's action. But his actions impose a process. We have plenty of problems in other regions of the world as well: the US, UK, Japan, to name a few. As troubling as the long-term fiscal outlook in all these regions is, they have processes in place to address them (some of these are also dysfunctional). The Eurozone had taken many steps back for each one forward over the past 9 months or so; when something good happens, it deserves recognition - it's just too easy to always shoot down those that try to be constructive. As such, we expressed a thumbs up to Draghi. We conducted an internal analysis of the fragmentation Draghi discussed; we will closely monitor the parameters he outlined to gauge whether progress is made based on his initiative. "the judge of whether sufficient austerity is implemented to warrant ECB support is the conditionality of EFSF/ESM, i.e. the types of rules the International Monetary Fund (IMF) introduces on countries." How does the "conditionality of the EFSF/ESM" differ from the other types of arrangements and criteria that we commonly hear in describing the events transpiring in the Eurozone? Axel Merk: My bad - talking about these issues day & night (I write this note at midnight in Finland, rounding up a European tour), I sometimes take things for granted. What I was expressing here is that when countries seek help, they subject themselves to the rules of those providing help. In the Eurozone, that's typically the "troika" of IMF, European Commission and the European Central Bank (with regard to the bank bailout in Spain, the IMF was not involved as they can only lend to countries, not specific institutions). The point here is that the ECB does not want to play judge as to whom to help, yet there needs to be a body. Ideally, of course, that "body" would be the market - but we are way beyond that. Instead, it's the European Commission, with some input from IMF and ECB. The way we look at this is that Draghi imposes tighter fiscal integration - a laudable step forward. From B.W: Tiny Switzerland whose population is less than that of the City of New York has amassed foreign currency reserves equivalent to 420 billion US dollars. A full 60% is euro denominated. Either a vote of confidence or lunacy. If the euro perishes, Switzerland will have enough euro notes to paper the walls in every public building. I would like to read your take on what's going on with the SNB. Axel Merk: If Swiss citizens were asked whether Switzerland should join the euro, the answer is likely a resounding no. As long as the public doesn't revolt, the Swiss National Bank is likely to get away with its policy. IMHO, I place the SNB policy into the lunacy camp - it's the wrong path for Switzerland. Think of it this way: you live in a neighborhood where most dump their garbage in their front yard. To blend in, are you also going to dump your own garbage into your front yard??? From W.H: If Axel appreciates feedback, you may wish to forward him the following. 1. the new policy is actually followed through (in a heavy atmosphere of Euro back office political jockeying). 2. any Euro vs. $ trading advantage will transcend crises such as Greece, Italy or others exiting the Euro. 3. advantages will not be offset in the event of major cataclysms in one or more of the "troubled" Euro countries. 4. the policy would persist in the event of the firing, forced resignation or death of Draghi. Axel Merk: At this stage we are looking for process, not miracles. Let's keep in mind where we set the bar for policy makers in other regions in the world.